In December 2017, Gloucestershire County Council cabinet decided to establish a new 900 place 11-16 secondary school in Cheltenham, widely regarded as necessary because of a looming crisis in secondary school admissions. They identified Kidnappers Lane in Leckhampton as their preferred site. Funding for the school was approved in February 2018 and the school is expected to open to new Year 7s in September 2021. It is being sponsored by outstanding local secondary school Balcarras who bring a welcome reputation for high academic standards and positive engagement with their local community. 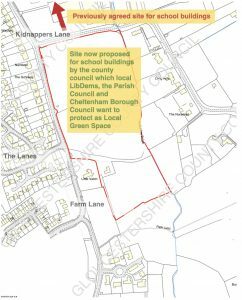 The planned Local Green Space where the county council want to build the new secondary school, instead of in the area already agreed for development. But the site of the new school is causing real concern and controversy and not just because of the likely impact on local traffic through narrow rural lanes. After more than ten years’ campaigning against the imposition of thousands of new houses all over Leckhampton’s green fields, local campaigners like the Leckhampton Green Land Action Group (LEGLAG) and the Parish Council accepted that the fields immediately next to the A46 Shurdington Road would be built on, principally for new homes. The remaining fields would be protected as Local Green Space, a new designation for local green spaces important to communities which I initiated when I was MP for Cheltenham and which is now national policy. After discussions with the county council, Cheltenham Borough Council included the new secondary school in their draft Local Plan on the land to be developed – at the corner of Shurdington Road and Kidnappers Lane. It was accepted that the school’s playing fields could be within the planned Local Green Space area further up Kidnappers Lane. This was agreed in writing by Gloucestershire County Council in March 2018 (as explained in these Cheltenham Borough Council minutes – see Question 10). Then in September 2018 the county council changed its mind and announced that despite all the previous discussions, it wanted to build the school in the area further up Kidnappers Lane everyone expected to be protected Local Green Space. Why? To save the county money. The new site was land they owned and would not have to buy in opposition to the housing developers. This would be a double whammy for Leckhampton: not only would green fields be lost to the newly built school but more of the land agreed for development would then go to housing as the developer always wanted but this would now be in addition to the new school. Local Lib Dem councillors, LEGLAG, the Parish Council and Cheltenham Borough Council have all lined up to oppose the loss of green space and likely overdevelopment. Unfortunately, local Conservative councillor Stephen Cooke has refused to oppose the county’s plan, describing it as the “lesser of two evils” and complaining that no-one had got the agreement of the developers! Worse, since the county council own the land proposed for the new school, they are allowed to apply to themselves for planning permission to build it instead of to the usual local planning authority, Cheltenham Borough Council. But this decision will be carefully scrutinised by the plan’s opponents. In law, the county council must pay proper attention to the traffic problems too much development would cause, as well as to the emerging Cheltenham Local Plan, the previous Cheltenham Local Plan and the emerging Leckhampton Neighbourhood Plan, all of which would rule out the use of the protected green field site. The county council’s summary of the situation can be found here but it contains fake news! It suggests that only one site was ever considered (not true, as the Cheltenham minutes show), that the site was previously identified for housing but this was “not taken up” (not true; the land had been earmarked for development until the plan for thousands of houses was ruled out by a government inspector) and that local Lib Dem councillor Iain Dobie supports the plan (not true; Iain welcomes a new school but has vociferously opposed the proposed green field site).